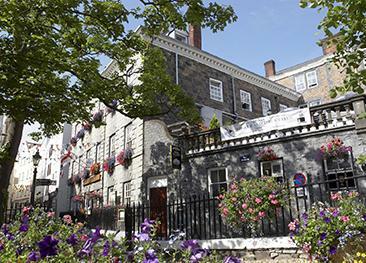 Built on the outskirts of St. Peter Port in 1765, Les Rocquettes was originally a private country mansion and became a hotel at the end of the Second World War. Les Rocquettes has kept up with times and offers spacious, contemporary accommodation as well as a brilliant in-house leisure complex. Like most homes turned into guests’ accommodation, the house is instantly welcoming with its neat yellow façade adorned with flowers. There is a selection of Classic and Superior single, double and twin rooms. Superior rooms are located in the hotel’s wing above the indoor pool, and feature a balcony. All rooms are en-suite and equipped with flat screen TV, clock radio, hairdryer, tea & coffee facilities, telephone and safe. The restaurant opens daily for breakfast and dinner, and for Sunday lunch. The Oak serves delicious fresh local food and holds one AA Rosette. 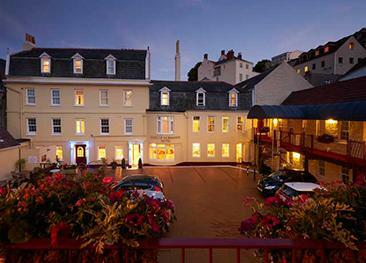 Les Rocquettes has two sister hotels in St. Peter Port - Hotel de Havelet & Moores Hotel - where you can also dine under the group’s “Dinner Exchange Scheme”. Open all day and serving bar lunches, this is the place to indulge, relax, and take a drink outside in the garden or on the terrace. Non-residents are welcome. The hotel offers themed food weeks and occasional live Jazz music in the evening. The heated indoor swimming pool features a children’s pool and Jacuzzi. There is a sauna and a steam room by the pool side. Large French windows open towards the hotel’s gardens and terrace. A well-equipped gym is available to hotel residents and to local members. A full range of beauty treatments are on offer 7 days a week. Les Rocquettes has St. Peter Port at its feet – walk down towards the harbour to discover a small town full of charm, character and history. A guided tour is advisable to hear the tales that lie behind the buildings. A lift is available to most floors and three of the Superior rooms have full wheelchair access. The room was comfortable and clean. there was a slight issue with the traffic noise from the busy road, but not intrusive at night and did not disturb our sleep. The restaurant was excellent, both the food and the service. Lovely hotel, with excellent facilities and perfect situation. No knowledge of vegetarian wines or ciders in the restaurant. Very comfortable hotel. We stayed on a half-board basis, the breakfasts and evening meals were excellent and the service from the staff could not be faulted. Would certainly stay here again. The hotel was good but not really geared for children. I changed my mind about which hotel to book based on the advisor's advice about child friendly hotels. I wish I had stayed with my original choice. Excellent hotel with helpful staff. Well located for visiting St Peter Port. Hotel very pleasant: staff attentive and helpful, but not in an "in your face" way. First class hotel in all respects. Good room, excellent food and extremely friendly and helpful staff. Courtesy bus driver particularly thoughtful and made our stay particularly memorable. 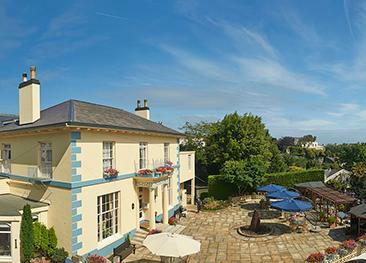 If we come back to Guernsey we wouldn't think of staying anywhere else.